Swiss Stamps - Who is William Tell? Many definitive Swiss stamps of the early 20th Century picture William Tell or his son. William Tell is a folk hero of Switzerland, whose legendary exploits were first recorded in a late 15th century Swiss chronicle. The story of William Tell is set in the early 14th Century, during the time of the original foundation of the Old Swiss Confederacy. According to the legend, Tell was an expert marksman with the crossbow , and it was he who assassinated Gessler, a tyrannical reeve of Habsburg Austria in Altdorf, Canton of Uri. 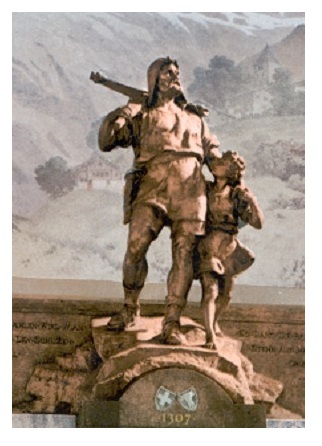 This image shows the central detail of the William Tell Monument in Altdorf, which was sculpted by Richard Kissling in 1895. The legend states that William Tell, originally from Bürglen, was widely known as an expert shot with the crossbow. During this time, the Habsburg emperors of Austria were seeking to dominate the Canton of Uri. Albrecht Gessler, the newly appointed Austrian Vogt of Altdorf, raised a pole in the village's central square, hung his hat on top of it, and demanded that all the citizens bow before the hat. When Tell passed by the hat, without bowing to it, he was arrested. As punishment, he was forced to shoot an apple off the head of his son, Walter, otherwise, both would be executed. Tell was promised freedom if he successfully made the shot. of William Tell, with his crossbow on his right shoulder. holding an apple, with the bolt through it, in his left hand. On November 18, 1307, Tell split an apple on his son's head with a bolt from his crossbow. Gessler noticed that, before the shot, Tell had removed two crossbow bolts from his quiver, not one, and after the shot, asked him why. Tell replied that if he had killed his son, he would have turned the crossbow on Gessler himself. Gessler was angered, had Tell bound, and then had Tell brought to his ship to be taken to his castle at Küssnacht. A storm broke on Lake Lucerne, and Tell managed to escape. He went by land to Küssnacht, and when Gessler arrived, William Tell shot him. William Tell's defiance sparked a rebellion, in which he played a leading part. The struggle eventually led to the formation of the Swiss Confederation. Tell is said to have fought again against Austria, in the 1315 Battle of Morgarten. William Tell died in 1354, while trying to rescue a drowning child from a river in Uri. series of 1941, and it features a modernized depiction of William Tell. Tradition dates the heroic actions of William Tell, and the oath of the Swiss confederates against the counts of Habsburg on the Rütli, back to 1307. Many Swiss stamps have been issued, over the years, depicting the Tell legend. Other Swiss stamps have also been issued, commemorating the Oath on the Rütli and the "Three Swiss", the first three cantonal confederates that formed the Old Swiss Confederation. But no documents have been found, concerning a person named William Tell or the assassination of a bailiff in central Switzerland. Only in 1470, more than a century after these events are alleged to have happened, a chronicle called the "White Book of Sarnen" reported the legend for the first time. A few years later, William Tell takes a prominent role in a ballad, singing the praises of the beginnings of the Swiss Confederation. Centuries later, William Tell is also mentioned in the standard history book, Chronicon Helveticum, written in 1734 by Aegidius Tschudi. The classical drama, William Tell, by the well-known German poet Friedrich von Schiller, was first performed in 1804 at Weimar, and it is the most popular version of the legend of William Tell. And to this day, Schiller's drama is performed on stage, every year, in Interlaken. Friedrich von Schiller was always very interested in the subject of liberty, and his drama played an important role in boosting German morale during the wars against Napoleon. Before and during the second World War, William Tell became an important symbol of the Swiss will to resist the Nazis and to defend Switzerland's autonomy against Hitler's ideas of the "Greater Germany". 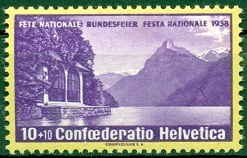 Swiss stamps for the National Festival, beginning in 1938. A chapel, dedicated to William Tell, was constructed in 1388, at the place, on Lake Lucerne, where William Tell is said to have escaped from Gessler's boat. The oldest documents mentioning a chapel there date back to 1516, and Tell's chapel became a place of pilgrimage from the 16th Century onward. The current chapel, shown on the stamp above, was constructed on the site in 1879. Four frescoes in the chapel, by Ernst Stuckelberger of Basel, show scenes from the legend of William Tell. They depict: (1) The bailiff Gessler forcing William Tell to shoot an apple off his son's head with his crossbow; (2) William Tell escaping from the boat of the bailiff Gessler during a storm on Lake Lucerne; (3) William Tell shooting the tyrant Gessler; and (4) The oath of the Swiss confederates on the Rütli. This chapel has been depicted several times on Swiss stamps since 1938. As has been written by 20th Century historians, there is no documented historical evidence that William Tell or the bailiff Gessler ever existed. The names and events in the legend do not fit into actual documented historical events in the Austrian Empire and in this part of Switzerland, during the early 14th Century. The first references to the legend of William Tell do not appear until the late 15th Century, almost 200 years after they were said to have happened. Conversely, there is no historical evidence that William Tell did not exist. Over 700 years have now passed, and this story will always be a mystery. It is not important whether William Tell existed or not. No other Swiss person is so widely known, Worldwide, as William Tell. He is the symbol of Swiss pride, courage, and the Swiss national hero of liberty. As with the Arthurian Legend of England, William Tell will ALWAYS be a real-life hero, and he will live on, in the hearts and minds of Swiss people, forever.